The Ghana Association of the Capital District of New York State (GACD) was founded ten years ago by a group of Ghanaians in the Capital District who felt the need to bring together Ghanaians living in the District for the purpose of recreating and enjoying the sociocultural and sense of community ever so present in Ghana. 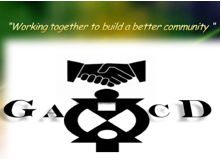 The GACD is a non-profit 501(c)3 organization dedicated to the welfare and well being of Ghanaians, and helping Ghanaians and their families living in the Capital District live full and productive lives. In this regard, we have networked with a number of other associations, churches, and other institutions that share our goals. This wonderful connection has led to a great and outstanding relationship with other African associations in the Capital District, and an enviable relationship with The Joshua Foundation, a top of the line collaboration with the University of Albany’s Africana Studies program and the Center for International Development Departments. The Ghana Association of the Capital District of New York State Inc. also has a very wonderful relationship/partnership with the Westminster Presbyterian Church of Albany, New York. This partnership stemmed from the Church’s initial love and concern for the well being of Ghanaians as well as other Africans living in the Capital District and abroad. The Ghana Association is governed by rules and regulations that allow for the fair treatment of all parties. It is to your benefit that you know and understand the stipulations of the constitution.